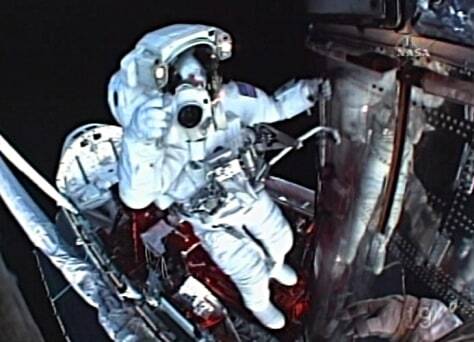 While he hangs onto Hubble, astronaut Drew Feustel snaps a picture of his crewmate, John Grunsfeld, during Monday's final spacewalk to upgrade the space telescope. The shuttle Atlantis' payload bay and crew cabin looms in the background. This view comes from Grunsfeld's "helmet-cam" video.